On Sunday I met and sketched with Jesse Munoz (a talented local comics artist who is responsible for inspiring me to do this blog). We chatted, looked at artwork (I brought a stack of Magic: The Gathering card paintings) and sketched for a couple of hours. 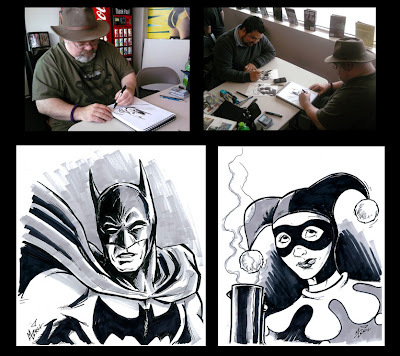 He was sketching Batman and Harley Quinn...so I did too. He did his sketches about twice as fast as me...maybe faster! Thus reinforcing my belief that this blog is a good idea! !